Jan. 3, 2013 5:00 p.m. When ever people gather things happen. In Leduc’s early history cabins were built, barns were raised, and stores were established. During these times people exchanged news about future weddings, babies born, and the passing of relatives. As Leduc grew it became more difficult for everyone to keep abreast of the most recent events other than by the “grapevine” which often became distorted the further it travelled. In 1896 Bob Edwards began to write a weekly news sheet that was both humorous and informative. People began to look forward to each issue. Unfortunately Edwards would move to Wetaskiwin and established the Wetaskiwin Free lance newspaper. Two years before Edwards moved to Wetaskiwin Clarence Howard Stout was arriving with his mother and stepdad to homestead in the Calmar district. Stout was twelve and quickly showed his athletic ability in football, baseball, and hockey. 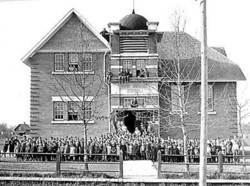 His education was done by correspondence and he began writing about things that were happening in the district, from time to time Edmonton newspapers would pick up and publish his stories. In 1906 his stepfather died and the following year, at the age of twenty-five, Clarence married the girl one farm down, Jessie Sangster. A year later they moved to Edmonton and Clarence would begin a fifty-year career in journalism. By 1915 he was writing for the Education Bulletin. Eleven years later he was the paper’s editor. Two years later Stout and his family moved to Calgary and he became the Calgary Herald’s news and managing editor in 1928. In 1950 Clarence Stout retired from active news work and moved back to Edmonton. He may have retired from active news reporting but he continued to contribute articles to newspapers about the history of the area. At the age of 73 he became the editor-in-chief for a historic book on Leduc & District (From Frontier Days in Leduc and District: 65 years of progress, 1891-1956). The book continues to be the principle source for information concerning the first 65 years of development in Leduc and the District. Eight years later the Stouts moved to Leduc. At the age of 80 C.H. Stout showed his athletic ability as he decided to build a replica of the original log cabin he and his stepfather had built in 1895 three miles south of Calmar. Clarence Howard Stout displayed why he is considered one of Alberta’s greatest story tellers of the 20th century when at the age of 90 he decided to tell his story. In 1974 he completed his story: Backtrack. The memoirs are deposited at the University of Alberta Library. C.H. Stout died in 1976 at the age of 93. While C.H. Stout was making his mark throughout Alberta several individuals were working hard to bring the events of the day to the residents of Leduc and District. It would take nearly six years after Bob Edwards left Leduc before a newspaper would regularly be available to citizens. In the meantime the Alberta Sun attempted to cover events in Leduc as part of their coverage of central Alberta communities. But, it would not be until 1902 when an Australian by the name of William Godson began to publish and edit a paper he called the Leduc Record. After two years the paper was sold to Arthur H. Liversidge. Liversidge changed the name to the Leduc Enterprise and reduced the paper from five columns per page to three. The life blood then and now for local newspapers are the advertisements that the paper can generate. It was common in the early days of newspapers to run ads on the front page of the paper that could even dominated the page over news articles. The reduction to three columns allowed the Enterprise to save expenses and increased their front-page advertisements coverage. By 1907 Liversidge sold his interest in the paper and James A. Ker became the new editor. The new paper that emerged was called the Leduc Representative a paper that can still be found on the newsstands every Friday. Through the years the paper has seen a number of editors come and go. Two of them, A. Russell Ennis and Fred Johns made a strong commitment to Leduc and served as Leduc mayors. These two men would serve as mayor for 29 years of Leduc’s first sixty-one years as a town. While Leduc newspapers were finding their way another individual would make their mark on the national scene and when it came to retire he would choose a community in the Leduc area. Born in 1930 he migrated to Alberta in 1957 with the skills of a draftsman and house painter. By 1962 he turned his skills into a political cartoonist for the Edmonton Journal. For the next twenty years he would apply his trade in Toronto and Montreal as well as Edmonton. Yardley-Jones returned to Edmonton in 1981 to complete his career where he started, at the Edmonton Journal. After thirty years as a political cartoonist John Yardley-Jones retired to the rural community of New Sarepta to set up shop as an artist and establish the community as the Cartoon Capital of Canada. In the meantime the ability of small rural newspapers to attract enough advertisements to cover the cost of printing became more and more difficult. The Leduc Representative would not be an exception and when Sun Media Corporation, a subsidiary of Quebecor Media Inc., came knocking and offering to purchase the paper along with a number of other Alberta weeklies it was an offer too good to refuse. The latest and most recent “newspaper” man was born in 1944 during the last stages of World War II in Holland. He had to share his crib with a small German soldier before the allies pushed the Germans out of the country. As he turned seven he found himself and his family at Pier 21 in Halifax boarding a train for B.C. In a strange land not knowing the language he was able to discover his entrepreneurial abilities and began to help his family. He acquired a number of skills and jobs over the years and by the time he arrived in Millet he was ready to try something new. Ted (Theunis) Okkerse and his wife Dian saw a need for the citizens of Millet and like Bob Edwards one hundred years ago sat down at the kitchen table and produced a news sheet. Over the past seventeen years the news sheet has grown to cover the events occurring from Wetaskiwin to Leduc and surrounding communities. Each week the Pipestone-Flyer carries on the tradition of bringing the local news to the citizens of Leduc and Wetaskiwin.